Cabins are leased for a minimum period of six months (less by negotiation at an increased rate). Read a summary of the lease contract. Arrange delivery for a day and at a time to suit you. outside of usual business hours, but only by arrangement. If you application is declined, your deposit is refunded in full. Weekly or monthly payment options - the choice is yours. No bond, (because of this, all payments must be in advance - there are no exceptions). Because all payments are made on the 15th of each month, how much you pay initially depends on what day of the month you obtain your cabin. Your next payment would be on the 15th April(for May), and then on the 15th of each month for the duration of the hire period. You could be as much as six weeks in credit. The week following delivery you start making payment and must keep the payments in advance. You cease payments towards the end of the hire period. It is your responsibly to prepare for the delivery of the cabin. 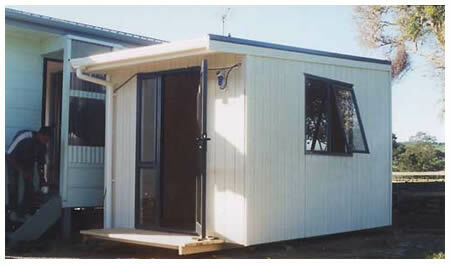 They are delivered on a purpose built trailer towed by a 4WD vehicle, or a small truck. For this reason we will need wheeled access to your site (no obstacles). 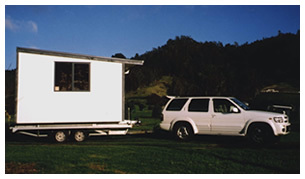 The trailer is 2.5 metres wide and the cabin, when on the trailer is 3.3 metres high. Overhead wires, trees and house eaves can sometimes prevent delivery. Please check! The cabin site needs to be relatively flat. We will do the final levelling.